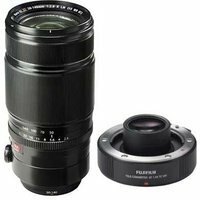 This package includes the Fujifilm 50-140mm f2.8 WR OIS XF telephoto zoom and Fujifilm 1.4x XF TC WR teleconverter for Fujifilm X compact system camera users. The lens offers a versatile focal length and constant f/2.8 aperture making it suitable for a wide range of photographic applications, including sport, travel, wildlife, and night time photography. With the teleconverter attached, the lens' focal length multiplies by 1.4x, from 40-150mm to 70-196mm (equivalent to 107-299mm on a 35mm format).